Today I brought out the Air Stage 390 with some Mummy Worms. I really like the Air Stage for the kind of fishing that I do most often, which is pond fishing or bayou fishing for small panfish. However I have found that Mummy Worms catch a far bigger variety of fish than I ever caught with red wigglers. It is so exciting hooking new species that you have never caught before or catching something far bigger than you expect. Today I hooked this catfish that I had to fight for over three minutes to get to the bank. Lately I have been on an Ultralight Worm Fishing kick. I'm using approximately 10 feet of Tenkara line, small 2 or 3 foot tippet, a small split shot, and a hook. This method has proved so deadly that I have not fished anything else in a few weeks. I have never had as much fun as I am having Ultralight Worm Fishing with a seiryu rod. You owe it to yourself to try it. Some of you, like me, don't have time to make it to the best places or to the best fishing in the US. This fishing makes any fish seem like you had the time and preparation to make it to a premier fishing destination. Even a smaller cat will give quite a fight on a seiryu rod, won't it? I'm working on a blog post about catfish right now, and I agree: On the right rod, they're great fun! 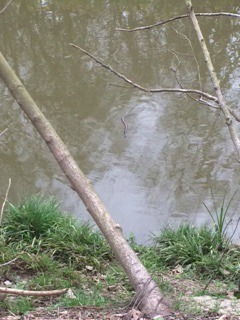 If there is water there are probably fish in it. Figuring out how to catch them and then doing it is the best fishing. I actually live in a pretty decent area for many types of fishing (Northwest Arkansas) but like a lot of people, don't always have time to go very far or for very long. I fish seiryu in the little "neighborhood" creeks and have BLAST catching various sunfish, smallmouth and largemouth bass, and many other fish. On the right rod it's just plain ole fun. Get in on it! Great Report! I live in a state with famous waters, Idaho, but enjoy the solitude of fishing more than catching monsters in less known waters. I am also impressed with the Mummy Worms. I don't have a "Seiryu" rod. However, I just compared my Suntech GM Suikie Keiryu Special 44 rod with the Suntech GMR Special a true Seiryu rod. There is a .5 penny difference and 2 inch difference fished at the similar length. Granted the Keiryu Special is heavier but it is a zoom rod. Is there any reason why I can't fish my Keiryu Special as a Seiryu rod? Granted the Nissin Air Stage and the Kurenai are lighter yet, but I can still fish the Keiryu down to a 9x tippet. The Diawa Seiryu X is very very close to the Keiryu Special too when compared at the same length. Call me confused over the difference between a "light" Keiryu rod vs a Seiryu rod. Can someone give me some enlightenment? The last time out I caught a 3 inch fish with my Keiryu Special and it was a fun fight. I am not even sure what it was, but returned it to the pond right away. It may have been a chub. Seemed like Seiryu fishing to me. I am tempted to give you a flip answer: one starts with a K and the other starts with an S.
Put it this way: for seiryu rods, the designers had chubs in mind, probably fishing with a light float and small baited hook (or multiple hooks on droppers) or a string of multiple small flies on droppers behind a conical wooden float (the "other" traditional Japanese fly fishing method that we never seem to hear about). For keiryu rods, the designers had trout in mind, probably fishing with yarn indicators instead of a float, and fishing with bait. The keiryu rods are likely to be stronger, as there is the chance for hooking trout that are quite a bit larger than chubs. You can certainly use a GM Keiryu Special (any length) to fish for smaller fish. The rods are flexible enough and sensitive enough to make it fun. I've been blurring the lines between the various Japanese fixed line fishing styles (and upsetting people) from the very beginning. I should have the tagline "Bastardizing Tenkara since 2010." Interesting discussion! Thankfully, I haven't run into the "Tenkara Police" on the water yet . . . Since I'm pretty well separated from the Japanese tenkara scene, and I've had to use the terms in a way that fits my situation, here's where I'm leaning: 1. Tenkara refers to the fixed-line, telescoping fly rods that I use, especially when fishing with unweighted flies or simple nymphs, or even small streamers. 2. Keiryu fishing is live bait fishing with fixed-line, telescoping rods, though these rods are often somewhat stiffer than my "tenkara" rods. 3. Seiryu fishing is targeting smaller fish with tenkara-style rods that are designed for smaller fish. 4. Micro fishing is specifically targeting really small fish, less than 6-inches in length. Of course, this is just my verbal shorthand, and I understand that there is plenty of room for discussion, debate, and clarification. Mostly we just fish for enjoyment and satisfaction. Chris, Thanks for the history lesson. I am interested in the roots of this type of fishing even though I really am a "get'er done" type of guy. I am pretty sure you are not referring to the Kyogi Special! I have been looking seriously at the Suntech Kurenai, and it will probably be my next rod. You ought to put a warning on the Suntech rods. Once you fish one you are spoiled. My only dedicated outing for small fish was very fun using my Shimotsuke Kiyotaki 24. I caught several 2-4 inch bass and 2-4 in bluegill. It was a lot of fun, but in my opinion this rod is a little on the stiff side to really enjoy the little guys. I can't believe how much I enjoyed going after little fish! Troy my friend at work has joined me in a number of species contest for the year. He is a spin fisherman. If I win he has to get a fixed line outfit, and if he wins I have to get a spin outfit. He is going to lose. Chris if you think you have bastardized Tenkara, if my new technique for Keiryu fishing for Carp works like I think it is, the Keiryu traditionalists cries will be heard all the way to Idaho! I can't wait until Lake Lowell thaws! After I get some fish I will share. If you have to get a spinning outfit I have just the one for you! It is to spinning gear what the Suntech rods are to keiryu! When people see me using a fixed-line rod of any sort, and I can tell they've NEVER seen anything like it before, I tell them it's Tenkara. If they get interested, that's when I explain that there are actually several closely related forms of fixed line fishing. I was at the James A. Reed area Sunday fishing for trout and catching sunfish. Two people asked about my "tenkara" rod without prompting and a third had a new Badger Bad Axe. Tenkara is the entry word but it is no longer an uncommon word. 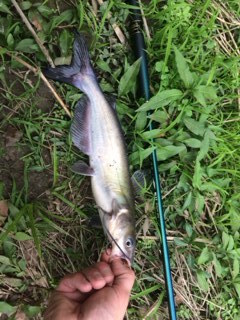 Coincidentally, my first catfish on a tenkara rod (or I might have been using my Suntech Field Master, I don't recall) was caught at Catclaw Lake at James A. Reed. It was a good size channel cat and put up quite a fight. The fun part of fishing small ponds and lakes is not knowing what species you might find at the end of your line!